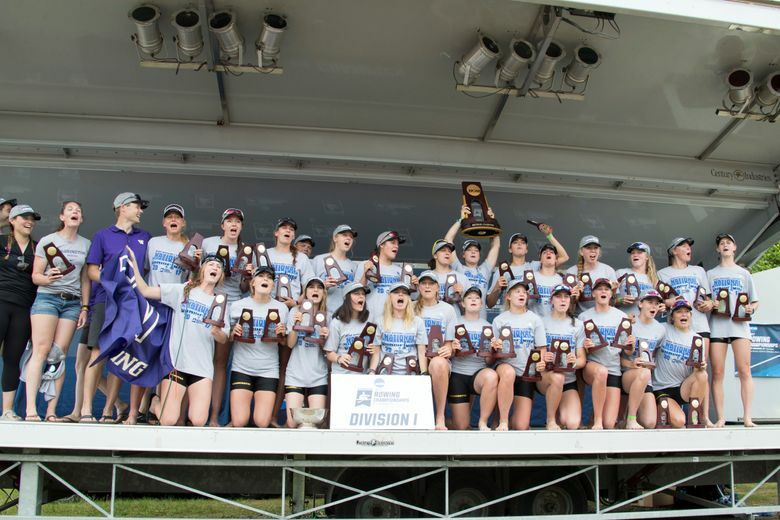 Washington not only won its first women's crew national title since 2001, it became the first team in the 20 years that it has been a sanctioned event to sweep all three races: the varsity eight, the second varsity eight and the four. 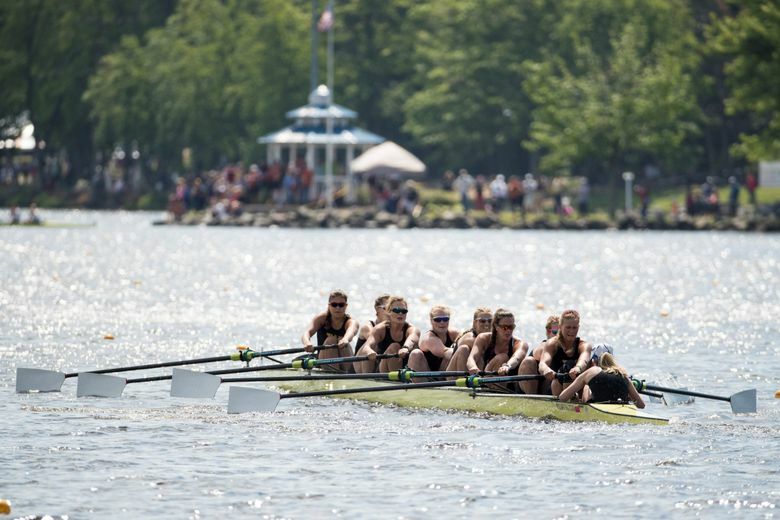 WEST WINDSOR, N.J. — The University of Washington women’s rowing team didn’t just win another NCAA national championship, the Huskies made history in storming to their fourth team title. 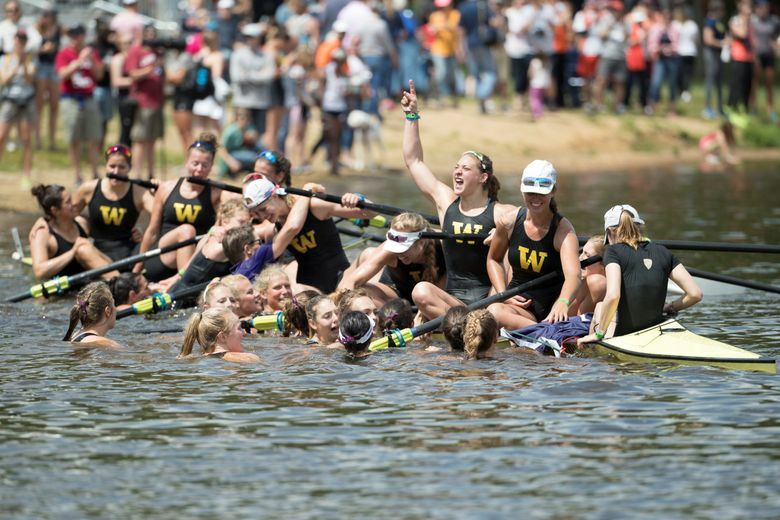 Washington swept all three grand events Sunday for the first time in the 21-year history of the regatta. Yasmin Farooq became the first coach to win the championship at two different schools, also claiming a title with Stanford. In addition, the former Olympian became the first coach to win an NCAA rowing championship in the inaugural season at the helm of the title team. The Huskies, who swept all nine races over three days on Mercer Lake, delivered the 500th team championship for the Pac-12, making the conference the first to reach the historic milestone. “The Pac-12 conference is the conference of champions,” Farooq said. Washington, which arrived as the top seed, performed up to its rankings. The Huskies surged wire-to-wire in the varsity four, second varsity eight and varsity eight to score 132 points — the maximum — and to outdistance conference rival California (123) and third-place Michigan (112). All three boats came into the weekend as the top seeds, but the Huskies still had to pull for 240 strokes over the 2,000-meter course into a slight headwind. 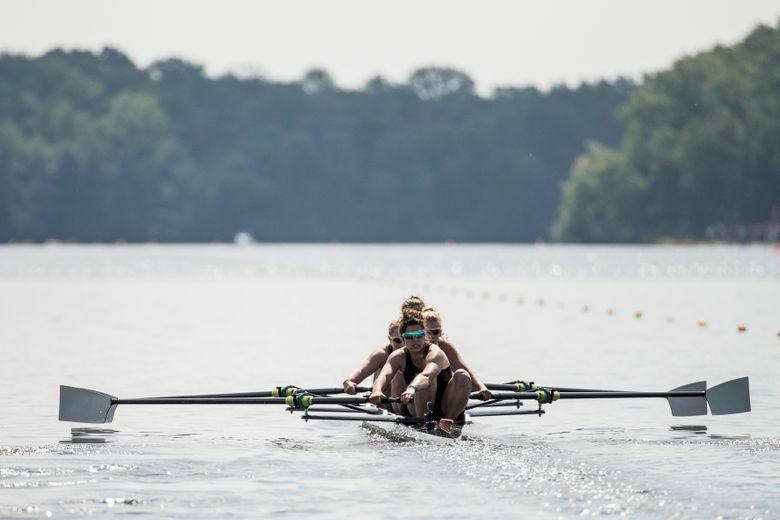 “Our mindset going in is you never know, so you never know if you are going to win until you cross the line first,” said Phoebe Marks-Nicholes, the junior coxswain for the varsity eight. In the varsity eight, the last race of the championships, Washington had to finish ahead of Cal to win its first team title since 2001. The race was the tightest for the Huskies. Like with the two other races, Washington’s strategy was to seize the lead early. “Every single boat executed the plan perfectly and it took a lot of courage to do that because it took a commitment early in the race that most people would think was unsustainable,” Farooq said. In the varsity eight, the Huskies mounted a half-boat lead at the 500-meter mark and padded it to seven seats at 750 meters. Stanford pulled within four seats with 500 meters to the finish line. “Stanford did an amazing job of trying to fight back, but we stuck together and the boat was really united all the way down the course,” said Marks-Nicholes, who attended Ballard High School. The Huskies held on for a wining time of 6:36.939. The Cardinal placed second in 6:38.520 and Cal took third in 6:40.069. “There was a breath of silence and then screaming,” said Marks-Nicholes on the reaction when crossing the finish line. The varsity eight victory punctuated the impact Farooq has made this season. She changed five seats on the boat after a loss to Cal last month in Seattle. The top boat responded by winning the Pac-12 championships last week and then added the marquee prize. “They trusted us,” said Farooq. “It was really just a matter to put people in the right places to get the most out of the boat. Farooq provided more than just elite strategy. “Yas believed in us and her coaching allowed us to become the team that I knew we could,” said Phillips. Farooq coached the Cardinal to the national title in 2009. Farooq felt the team was ready to take the next step and return Washington rowing back to the top of the sport after winning the conference championship. “In rowing, we’ve always known the Pac-12 championships we’re going to be a bloodbath, but it also get you ready for the NCAAs like no other conference. Still, the Huskies had to pull for every stroke to win. “I competed in two Olympics and I covered five Olympics for NBC and outside of the Olympics, this is the most competitive racing on the planet,” Farooq said about the NCAAs. Farooq said she was asked before the season if the Huskies could win the NCAA title. She might not have expected a historic sweep, but she could see a title on the horizon. • Washington State, competing in its fifth straight NCAA championships, finished 14th. The Cougars’ three boats advanced to the C final. The varsity eight won its C final to take 12th. The second varsity eight was second in its C final for 14th. The varsity four was third for 15th place. WSU was ranked 15th in the nation entering nationals. Combined team results (varsity 8, second V8 and varsity 4 grand finals) determine NCAA national champ. UW won team titles in 2001, 1998 and 1997. UW last won V8 race in 2002.